[To Admins] eDom Council is Born! 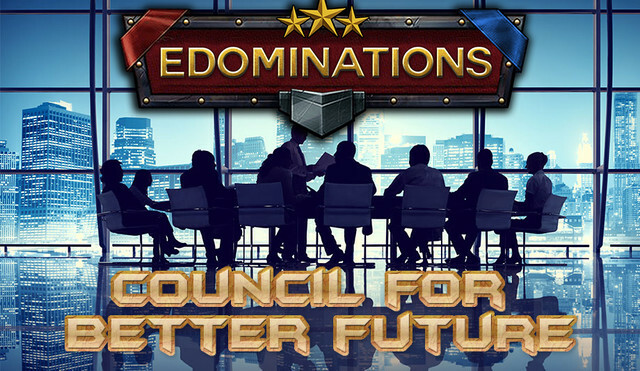 We are here to announce the start of the eDominations Council initiative! The Country Presidents of the top 20 countries united in the name of the future of our game! Step by step we will include influential players into the group so we can become one think tank that will work with the Administration of the game for our mutual well-being. Let’s start with some of the proposals we gathered and discussed between each other. We would like to meet up with the Administration team in good time at our Discord server, so we can discuss the possible implementations of them into the game. We hope all the players of eDominations would be able to unite under the common goal for a better game that will last long – for the sake of our entertainment, and eDom’s profitability! I will ask all players to sign this in the comments section if they support it! First and foremost we would like to have a constant dialogue with the team that stays behind the game! On multiple occasions argumented proposals and critiques were met with hostile attitude which is unacceptable. This should change! We can’t play the game without you, and you can’t have a game without us! We would like the implementation of informational alliance into the game – in order to state which alliance one country is aligned, which are the other countries in it, a place where the alliance can put some information about itself, which are the other alliances, maybe the positions of the officers and so on. There might be some means of communication with the alliance citizens as well, non-formal battle priorities and such – the possibilities are endless. Important to notice that the alliance module is completely INFORMATIONAL! MPP is the most effective and productive mechanic in order to tie the countries. Geopolitics are basically non-existent outside the MPP page. New players and double clickers come and ask dozens of people about the current situation, and unfortunately most of the time they don’t get to be informed. We should have an organized system that allows players to know and do everything without leaving the game itself. Be more active regarding the game missions, challenges, monthly and bi-monthly events. We saw a bunch of different things that never came back into the game, besides the March March which is completely non-viable at this state for the majority of the players. We need more content that will engage people, make them stay and even return back to the game. No one gets anything out of a bunch of double-clicker zombies and leaving players – neither we citizens, nor you admins. Rework the gold medal system since we are reaching a point where one can neither tank nor even fight regularly because of a big negative loss. The game hasn’t yet to reach a state where people can self-sustain themselves. Fighting is the fundamental of the game which keeps it flowing. The increase of gold influx, which might negatively influence the current module of the economy, an excuse that you have used up to this point, is not valid from our point of view anymore. We have a lot of advanced fighters who have to put tens of millions of damage for one single medal. The disproportion is more than we can stand, even with the current prices of the weaponry. Please revisit and finish the Media House update! We know that you have had problems with it, but we also happen to know how many times you told us you can’t do something new, because the Media House Update requires much of your attention, yet we haven’t seen any updates on it. Journalism module is completely useless right now, but a lot of journalists and journalist-wanna-bes desire to get more involved with it. Revisit all your mechanics of wars, laws and economy. There are a lot of bugs and contradictions which were stated multiple times before. The game should be fair and the Admin intervention should be kept to minimum and only at emergency. Change the way voting the laws works. Make it possible for a law to pass or fail once the required majority for it has been reached in votes. With the current module, even when the condition of majority is provided, countries get stuck until the 24 hour condition is satisfied. With our proposal, more strategy and preparation would be required; it will promote and reward countries with active governments and congresses. The current functionality to supply citizens in a home battle with weapons and automatically collect money from them is something we admire. Please think about a way to implement this system into allies’ battles – surely it might be a technical challenge, but it should not be impossible. This is just a part of the proposals we are going to put on the table. We will make sure to continue the brainstorming and bring new ones when they are available. We hope the administration team would be willing to arrange a meeting with us in which we would be able to revisit each of the mentioned proposals. Signed by the most handsome player(me)!!! Signed by The Emperor of China - JamesBond. Signed by CP of Spain. Signed by unknown citizen of Slovenia. To buy some gold we have mastercard. For everything else we have danider! Signed by 10 star freak. Signed by CP of Hungary. Signed by PP Papige glabatora! Firmado por Catalunya! Llibertat presos politics! I like alliances, laws and supply sistem !